Every now & then, you find an excuse to kick back, relax & enjoy Tahoe. This is that perfect excuse!!! Tahoe Paradise Park is always a great place to get away from the traffic & enjoy the weekend. Saturday June 16th, we will be hosting our anual "Day In Paradise". 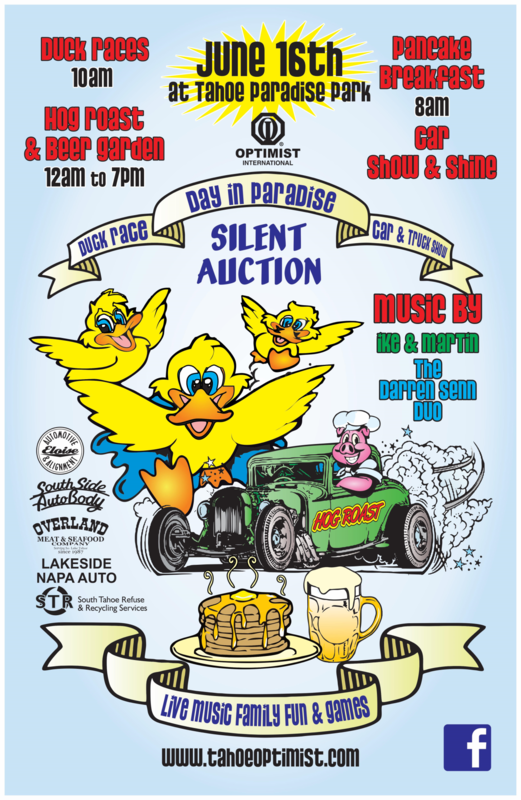 Activities include a pancake breakfast, Duck races on the Upper Truckee River, Kids games, Lunch provided by Overland Meat Co., over $15,000 worth of silent auction prizes to bid on, FREE live music @ Lake Baron, Luau style hog roast, Beer gardens & much more.